Scotland's women won bronze medals at the European Curling Championships with a commanding 8-4 win over Denmark. Having lost twice to the Danes over the week, the Scots scored four doubles to end the contest with two ends to spare. "What a fantastic game we played. 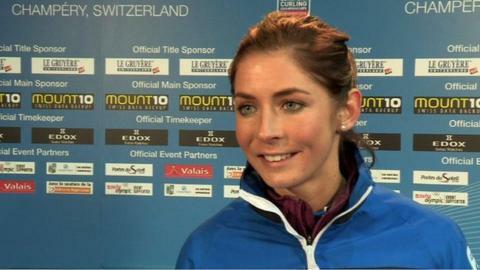 I just wish we could have played like that all week," said skip Eve Muirhead. "We can't win them all, and it's hard to stay up there all the time, but when it came to that bronze match we really did step it up." Denmark had beaten Scotland 7-6 in the first match of the round-robin stage, as well as 8-3 win on Thursday to end the Scots' chances of getting to the final. While in the latter encounter the Danes took control from the start, this time it was the Scots who dictated play. "We definitely weren't prepared to get beaten again by them," Vicky Adams told BBC Sport. "So we just came out with a real fighting spirit." Three of the four players in the line-up had found themselves in the same position at the Winter Olympics where they needed to beat Switzerland to take the bronze medal or go home empty handed. Vice-skip Anna Sloan revealed they drew on that experience of coming through victorious in such a pressure situation before Friday night's game in Champery, Switzerland. "In our team chat Dave Hay, our coach, reminded us of what we did in Sochi and I think that was good thing," she explained. "I think that was the most perfect game of curling, score-wise, we've played all season. "We may not have performed our best this week but we know we're a play-off team and when there's a medal at stake we turn up when it matters." For new team member, Sarah Reid, it was her first senior international medal as a playing lead. Her shot accuracy in the bronze medal match was an impressive 97%. "It's fantastic just to end the event on a high and get on that podium and claim a medal," said Reid. In the B Division, England's men also won the bronze medal after they beat Hungary 8-5. However, they miss out of promotion to the top tier by a single placing as only the top two teams go up each year. Switzerland take on Russia in the women's final on Saturday, with Sweden and Norway meeting in the men's final.